The core consists of pith in the center, with concentric rings around it with cross through radial resin canals and wood rays. The sapwood is the outer, not yet hardened, lighter colored wood that leads sap upwards. It is a still living storage area for nutrients. The heartwood is centrally located and (in almost all trees) death. As there is every year a ring formed, indicates the number of rings the age of the tree. In dry years, the ring will be narrower than in good years. Against the outer -ring is the cambium, the growth layer between the bark and wood appearing in the spring like a wet film. Then comes the bark with on the outside the cork cambium, which forms cortex cells. With at last the visible and hard, dry, corky exterior bark. The cambium makes at the inside timber that transports nutrients from the roots to the leaves. To the outside, the cambium makes a much thinner layer of bark tissue, in order to transport the products that are formed in the leaves (especially carbohydrates) to elsewhere. Cambium is especially living tissue, bark is dead material. The bark is similar to our epidermis, the outer layer of horny skin. Under the skin is much thicker, (vascularized) dermis, similar to the bark. The outer, mostly raw and chapped, visible layer of the cambium is the bark. Because there are always new layers recovering that can be several centimeters thick. The cracks are caused by the growing size of the trunk. In some species the outer cortical layer flakes. In a pasture grazed by sheep, donkeys, goats, goose or horses, you need to provide protection around (young) trees, otherwise the bark is gnawed. Use bars or mesh with openings where they cannot bite in between. And make the wire cage high enough. Especially goats (and deer) are nibblers. An around debarked tree dies. When ringing, a deep strip of bark (cambium and bark) of approx 15 cm is peelded from around the trunk, so that all the sap is interrupted. This usually happens in the summer. The tree dies. A too narrow ring can grow back over. Girdling in forest management is done to increase the percentage of standing dead wood in a forest and to eliminate exotics (bird cherry (Prunus serotina), American oak..). If you want to attach the fence to a stem don’t do it with nails or staples. More preferably, with a thread around the trunk, which can grow with the thickness of the tree. Otherwise, the fence will grow over the years in the bark and into the wood. Nails and wire in the trunk are a danger to the chain saw and make the most beautiful part of the trunk worthless to the sawmill. Each entry represents a rust-colored stain that makes the wood almost worthless. If you wish to use logs or branches as poles or want to keep them, you can better get them barked. Bark contains many nutrients and are happy attacked by insects. Debarked wood will last longer. 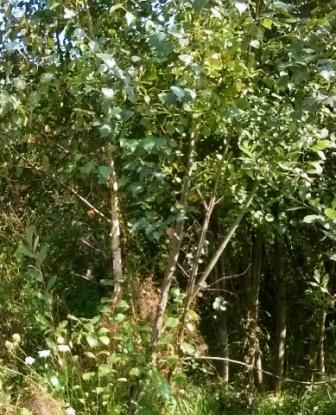 Bark can be used as ground cover. Even in ornamental gardens for decorative use. Of course, it also can be part of the compost heap. Or, if it is dried in the stove (as kindle). Birch belongs to the pioneer vegetation: the vegetation that will colonize first released land. On the barren plains the sun can crack or dry out new vegetation, especially in the spring with cold nights, followed by a clear sky. Therefore, some trees (e.g. pine) have a corky, insulating bark. The birch bark is white as protection to the sun (burn). Which reflects light and heat. The outer layer of the bark renews constantly and sometimes dissolves into thin strips that by the betulin have great resistance to decay. Also wet you can use them as fire starter. Because they are lightweight, water resistant and extremely durable, the bark was also used as roofing. 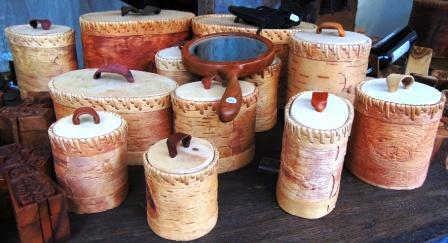 Birch bark is also used as writing material (paper) as Guido Gezelle tells in a poem. And as roofing. There was even made ​​clothing, shoes, leggings, capes of. Also, bowls, bags and even canoes. Or torches and candles. Whether there is extrected birch tar (or pitch) of. And the juice is still used as a drink, remedy, for wine and shampoo. The buds and leaves contain useful saponins (soap substances), tannin, resin, volatile oil and glycosides (sugar -like substances). Birch leaf can be used in dyeing wool. Especially the bark of young oak contains a lot of tannins. The dried bark was ground and (lukewarm) water soaked to extract tannic. The fluid is called bark tan. The cork oak (see <Cork>) (Quercus suber) certainly yields as cork on wine bottles, and as insulation, floor or wall coverings, one of the most famous applications of bark. The best bark strap material comes from thin branches. Cortex is thinner. Use walnut (Juglans), lime (Tilia Genus), willow (Salix Genus), ash (Fraxinus), elm (Ulmus), cherry (Prunus), cedar (Cedrus), chestnut (Castanea sativa), maple (Acer) poplar (Populus deltoides), oak (Quercus). The soft inner bark of willow contains salicylic acid and has been used for centuries as aspirin. The best is the soft bark near the ground or on exposed roots. This contains the most nutrients. Birch, fir, pine, willow are useful. You can grind the dried, roasted bark into flour, or wisps cook as spaghetti (or raw food). 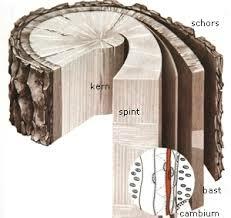 Bark and cambium are common, especially in non-specialized literature, both used for the entire outer layers around a branch or tree.